My friend Erik points out that The Parking Lot Movie, a documentary by Meghan Eckman, is complete! 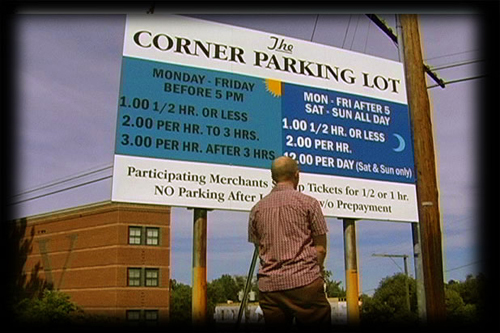 The film is about the legendary Corner Parking Lot in Charlottesville, Virginia, a place where James McNew (of Yo La Tengo), members of Happy Flowers and seemingly countless other interesting and wonderful people have worked. I’m really excited to see the film, as I’ve known a lot of folks who work/have worked at the CPL, and I know that Meghan put tons of work and thought into her portrayal. Update: Looks like the movie isn’t quite done, but close. I am really excited about seeing the final product! Another note: I reviewed Meghan Eckman’s excellent Animental tour documentary Road Does Not End for The Declaration a few years back.